Scottish Care now represents the largest group of Health and Social Care sector independent providers across Scotland delivering residential care, day care, care at home and housing support. There is recognition of the merits for a strong single representative body in Scotland and our core strategy to create the strongest possible alliance and collective voice to protect and promote the interests of all independent public care sector providers in Scotland. 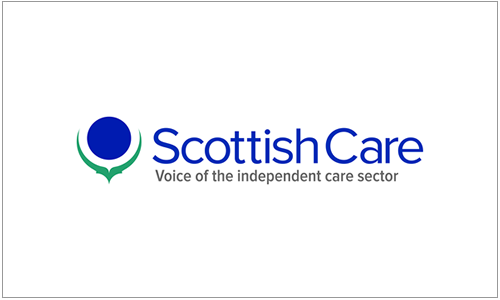 Working on behalf of a range of small, medium and large providers, Scottish Care speaks with a single unified voice for both members and the whole independent care sector. Our membership includes organisations of varying types and sizes, amongst them single providers, small and medium sized groups, national providers and not-for-profit voluntary organisations and associations. Our members deliver a wide range of registered services for older people and those with long term conditions, learning disabilities, physical disabilities, dementia or mental health problems. Scottish Care is committed to supporting a quality orientated, independent sector that offers real choice and value for money. Our aim is to create an environment in which care providers can continue to deliver and develop the high quality care that communities require and deserve. Scottish Care is at the forefront of the national policy agenda and so we are ideally placed to put forward not just the views of our members but also those of the whole care sector. Scottish Care is represented on key government and regulatory policy groups and we receive copies of all relevant sector consultation documents. This allows us to provide updates on policy and development and feed the comments of our members into the consultation process. Our contacts in government, regulation and commissioning also mean that we are able to lobby and influence views at the highest level.